Bobby Comfort wanted to be a good something. He turned out to be a great criminal. January 2, 1972: Men in tuxedos rob the Pierre, a New York hotel. They get away with $11 million worth of cash and jewelry. The police are baffled by how large-scale a heist could go off so smoothly. The answer was in the leader of the thieves, a man by the name of Bobby Comfort. Comfort took to crime from a young age, card sharping, petty theft, and eventually robbery. Taking money from the rich, though, was where he excelled. Like Robin Hood (only keeping the loot himself), Comfort masterminded what was, at the time, the most lucrative heist in history. Pulitzer Prize-winning journalist Ira Berkow chronicles the crime, using first-hand accounts to weave together a ripping cops-and-robbers yarn, and a portrait of a truly American rogue. ©1987 Ira Berkow (P)2014 Audible Inc. This is face passed and exciting. Hard to believe how much the did and got away with before the Pierre. Worth the listen. I find it interesting how people get to where they went. What the motivations were to get there and the ingenuity it took to get there. Given the cleverness of the thieves, I always wonder what they would have invented or done in a legal profession. What gadgets they may have created or betterment they could have done. Some of the most ingenious ideas are used in committing crimes. Bobby got comfortable robbing hotels. Comfort's not a good thing while committing crimes. 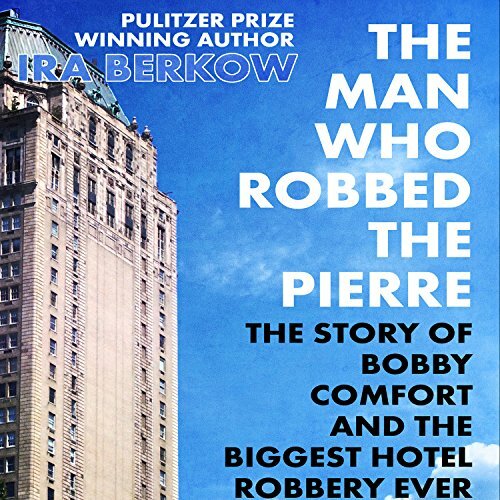 Would you consider the audio edition of The Man Who Robbed the Pierre to be better than the print version? Maybe--I found the narrator somewhat distracting because of his strange cadence. The main character, Comfort, was a lifetime criminal but you find yourself liking him and not wanting him to get caught. I have listened to other audiobooks performed by Hoye. I know that he has won awards, but I find him somewhat "NPR"-like in his presentation. He does a good job when reading quotes, but at the end of every sentence he drags out the last word. Very annouing. Yes--really wanted to find out how it finished.